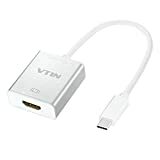 This DisplayPort to VGA Active adapter facilitates to connect your Displayport equipped laptop or desktop to a VGA enabled monitor or projector with a separate VGA cable(sold separately). 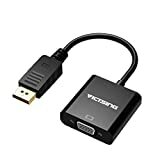 This DP to VGA adapter converts digital displayport signal to analog VGA signal, which can transmit high definition video from your computer to a monitor for video streaming or gaming. Configure your monitor for an Extended Desktop or Mirrored Display. Support point-to-point-transmission. The video resolution is up to 1920×1200 and 1080P(Full HD). Easy to use. No external power adapter needed and without software driver installation. Plug and play. The DisplayPort to VGA Male converter supports AMD Eyefinity Multi-Display Technology, which is perfect for designers, technicists, engineers and widely used in theater, large meeting room and team-based game. The DisplayPort connector with latches provides a secure connection with a release button, which need to be depressed before unplugging. This displayport to VGA converter provides an easy and cost-effective solution to connect a DP equipped notebook or desktop to VGA enabled monitor or projector with a VGA cable(sold separately) for high-definition video streaming. With point to point transmission technology, this DisplayPort to VGA Video converter allows to stream high definition video 1920×1200(up to Full HD 1080p) in your DP compatible computer to monitor or projector with VGA. Compatible with AMD Eyefinity Multi-Display Technology, this DP to VGA active adapter supports to hook up extended monitors to your computer for gaming or digital signage application. Plug and play. No external power adapter is needed. With this adapter, you can mirror or extend your desktop for an expanded workstation or show presentations at school or work. 2. Can only convert signal from DisplayPort to VGA. This is not a bi-directional adapter. 45 days money-back and 12-month, worry-free Guarantee! This type C to HDMI adapter allows you to mirror your 2015 macbook display to your HDMI enabled TV or display with the resolution up to 4K*2K (3840*2160) and 1080p. The final resolution depends on the resolution of your display. This mini USB type C to HDMI adapter cable adopted alloy aluminum case and 24K gold-plated port. It shields external electromagnetic interference and resist corrosion. Better heat dissipation,signal transmission and durability. Simply connect the adapter directly to the USB-C port on your MacBook and then to your TV or projector via an HDMI cable(sold separately).No driver needed. It is low-profile and will not block adjacent ports on your computer.Same surface finish with your macbook,which will be a perfect companion for your favorite laptop. Portable and lightweight makes it easy to carry with you. USB 3.1 Type C to Hdmi adapter is designed to mirror your 2015 new apple macbook 12 inch laptop to your HDMI-enabled TV or monitor even up to 4K (3840*2160)display. A gorgeous companion for your macbook to enjoy large screen home theater. This USB Type C to HDMI adapter allows you to stream video and audio in your macbook at the max resolution up to 4k(3840*2160P),1080P. Experience ultra clear visual effect on larger screen. This portable USB C to hdmi adapter uses high quality alloy aluminum case,which makes it sleek and durable.With al aluminum case,the heat dissipation will be better.Wear-resistant and long lifespan. This Type C to hdmi cable adopted 24K gold-plated port so that it can shield external interference to ensure best signal performance. 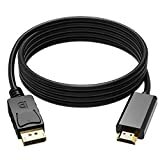 This Type C to 4k*2k hdmi cable is delicate and low profile so it will not block your adjacent port on your computer. Beautiful appearance matches your macbook perfectly.